Visitors to Wildcats Hockey Club in Riverside and Carlsbad this season may notice something different about what they’re seeing on the ice. Practices are more focused, there’s more emphasis on skill development and overall organization is a higher priority. That’s because the Wildcats have implemented a new curriculum – something that’s long been in the making and designed to get the most out of every player’s potential. The curriculum is the brainchild of the Wildcats’ leadership group, which includes Frank, Paul Esdale, Tomas Kapusta and Pepper Pierman, as well as input from their contacts at USA Hockey. Similar to a school curriculum, the idea is that there should be specific teaching methods and development goals for each age level, and that they should build on each other as the players progress in age. 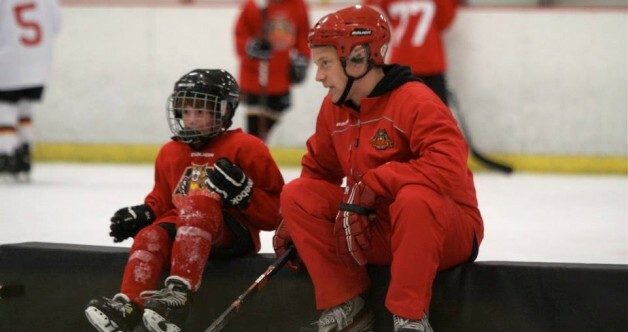 “What we often see in youth hockey today is that a coach shows up and runs a practice that’s tailored to the win-at-all-costs mentality or short-term goals of winning a game,” Esdale explained. “Our curriculum’s focus is on the long-term development of the athlete and overall growth of each individual in that age group. Frank and Esdale said the plan starts with larger goals, concepts and ideas, then breaks them down into smaller ones until each team has a plan of attack for every week and day of the season. To help players, coaches and parents understand the new approach, the daily schedules are spelled out in online calendars. “We’ve planned out the season day-by-day, from practice plans to what skills kids are going to learn to the concepts they need to understand,” Frank said. The idea for the curriculum kicked into gear when Esdale and Frank attended the North American Rink Conference & Expo last year. The focus is on giving all athletes the best youth hockey experience and impacting them beyond the hockey rink. Frank gave Esdale most of the credit for developing the curriculum, noting that the former Brown University defenseman spent many weeks staying up until 3 or 4 a.m. each night drafting a plan, then going over it with the Wildcats’ coaches and refining it until every last detail was covered. The curriculum is in place this season for Mites, Squirts and Pee Wees, and is expected to be implemented for Bantams and Midgets as well next year. The new curriculum has gotten the attention of USA Hockey. Esdale said he’s already seen progress, with more spirited practices and more engaged players. “It’s been really well-received. It’s based on the long-term development of the kids. It’s not like if we lose a game on Sunday, then we scratch the plan and focus on something else. Wins and losses are important, but doing the right thing and giving back to the game and players is more important than anything.